It seems that Asus is not the only one with an X99 motherboard that features more pins for overclocking. On a recent event a certain Gigabyte X99 SOC Force LN2 (GA-X99-SOC Force LN2) was spotted featuring a special LGA-2011v3 socket that has more pins than the usual X99 motherboard. Asus was the first one to officially reveal their still patent-pending Asus OC Socket, featuring more pins. Check out more features about the upcoming Gigabyte X99 SOC Force LN2 below. The Gigabyte X99 SOC Force LN2 is somewhat similar with its mainstream counterpart, the Z97 SOC Force LN2 motherboard. The GA-X99 SOC Force LN2 is also built to cater the demands of every overclockers, specially the extreme overclockers community. Actually there’s not much information about this motherboard yet since Gigabyte hasn’t officially announced this motherboard. Most of the motherboards features and specifications can be deciphered just by looking at the motherboard itself. 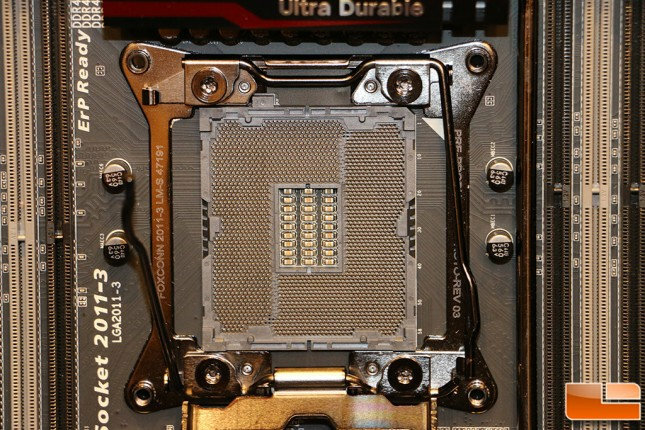 But the most interesting feature about the Gigabyte X99 SOC Force LN2 is its special LGA-2011v3 socket featuring more pins than the usual, and this is similar to the patent-pending Asus OC Socket. Just like the OC Socket, the special socket of the X99 SOC Force LN2 is also expected to overclock better compared to the x99 motherboards with lesser pins. 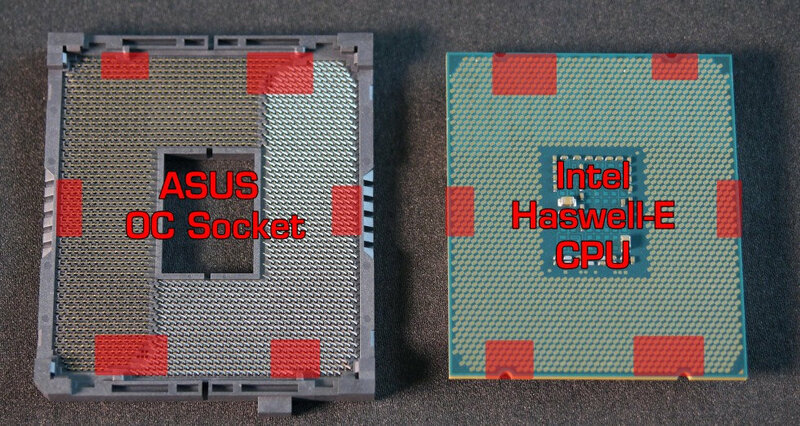 Below are close up shots of the socket on the X99 SOC Force LN2 and the Asus OC Socket. If you noticed, both are very similar, if not 100% similar! 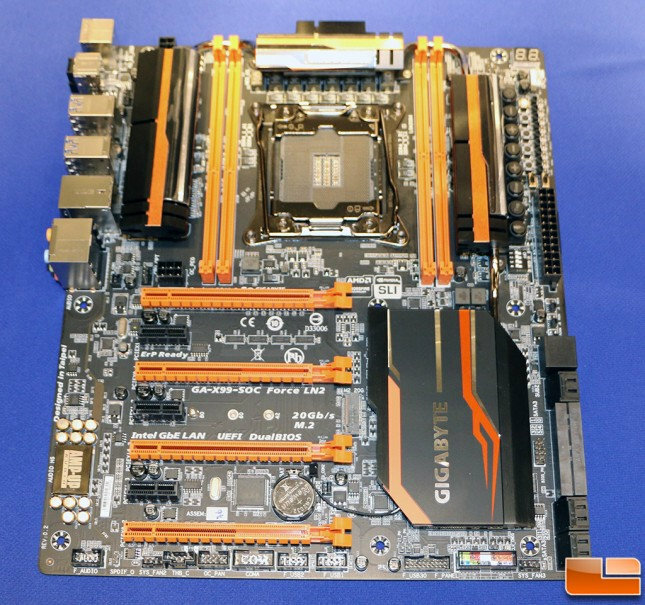 Gigabyte has been successful with their OC motherboards since more and more overclockers are using the company’s OC series for overclocking and benchmarking. And I wonder how well or bad will this motherboard be in terms of overclocking against the Asus Rampage V Extreme that also features a socket with more pins. I’m sure we will know the answers very soon. I’m sure Gigabyte didn’t make their own special socket right after Asus announced their OC Socket. It’s Foxconn who makes the sockets, but why is Asus applying for a patent for their socket? Is there any real difference between the Asus OC socket and Gigabyte’s special socket? And if Asus’ got their patent, will Gigabyte be in trouble and will we see another patent war? Finally will we see MSI implement the same special socket on their X99 OC series? Based on visual observation, the Gigabyte X99 SOC Force LN2 features four DDR4 DIMM slots and an 8 phase power design. It features all the overclocking-centric onboard buttons like the one we saw on the GA-Z97X SOC Force LN2. It has 4x PCIE slots supporting SLI and CorssFireX multiple graphics card configuration, and 3x PCIE x1 slots for add on cards. There is an optional 6 pin power connector used for overclocking. For storage, it features the regular SATA 6Gbps ports, SATA Express ports and an M.2 20Gbps port. It also features AMP-UP audio core like some of Gigabyte’s latest motherboards. And on the rear I/O panel, you get the usual suspects like USB ports, audio ports, and the likes. We’ll know more about the Gigabyte GA-X99-SOC Force LN2 soon when the company officially unleashes this overclocking beast.